Salisbury City manager Mikey Harris has agreed a new one-year rolling contract. Harris was promoted from assistant to manager in July last year, making him English football's youngest full-time boss at the age of 28. 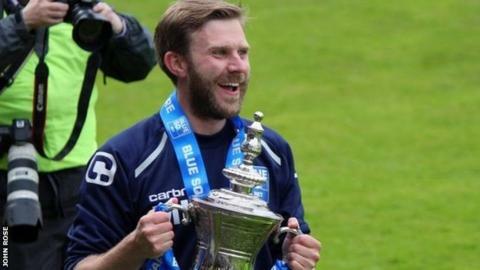 He led Salisbury to a 12th-place finish this season, their first year back in the Conference Premier, and they also reached the second round of the FA Cup. "I'm already looking forward to next season. Planning has started already," he told BBC Wiltshire. "It's going to be interesting to see how we build on what we've done this year. I'm looking forward to the challenge." Harris was Salisbury assistant for five years, initially working under Tommy Widdrington before midfielder Darrell Clarke took over as manager in 2010. After two promotions in three years, Clarke left to join Bristol Rovers as assistant last summer and Harris moved up to take charge of the Whites' first-team.